Foxconn founder Terry Gou, right, says he will resign soon. Foxconn Technologies is starting a new company in California’s Silicon Valley to concentrate on artificial intelligence for factory floor automation. The plan comes as Foxconn looks for ways to deal with the slowdown of smartphone sales globally, demands for higher wages and a changing workforce that is sidestepping manufacturing. Foxconn assembles thousands of iPhones and iPads and is among Apple’s biggest contractors. 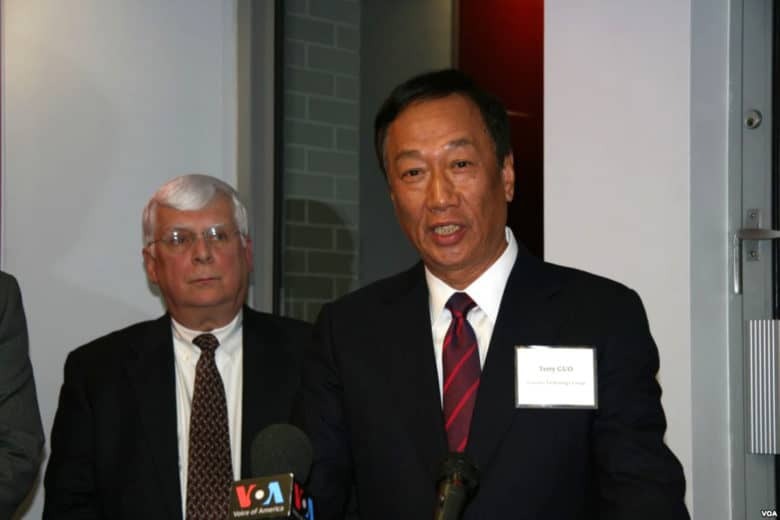 During an event last Friday evening at Stanford University, Foxconn founder Terry Gou introduced industrial engineering professor Jay Lee of the University of Cincinnati as his partner in the new firm, which will be named Industrial AI System. The Nikkei Asian Review broke the story this morning. Gou plans to employ about 100 engineers and deep learning experts. Foxconn already has broken ground in America as it builds a $10 billion facility in Wisconsin, where lawmakers provided tax breaks with the promise of hundreds of new jobs. Whether the Wisconsin plant gets that many jobs remain to be seen as Gou pushes for greater manufacturing efficiency with automation. Foxconn has more than 1 million workers, including 600,000 in Taiwan, according to the Silicon Valley Business Journal. The Stanford University event was only open to 100 people, which, AI researches, Stanford students, and tech entrepreneurs, reports said. Foxconn employs 1,000 people in its automation division and last month, spun off its industrial internet solutions division.